Thanks to Colin G0PHO and Bradley M0XBW for the on-air test today - and enjoyable mobile QSOs! I can confirm that the hands-free kit is working well. 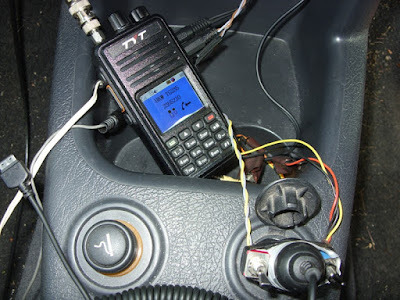 I thought I would add this photo of the radio in the car, although it is a little confused because I still have the wiring for the FT60 handheld here too. There are two toggle switches taped to the cigarette lighter plug, bottom right. the left hand one is for the DMR radio. The "well" in which the radio sits is in the centre console and the TX/RX switch is just in-front of the gear lever, so it is easy to find without looking. I use the internal battery of the radio. 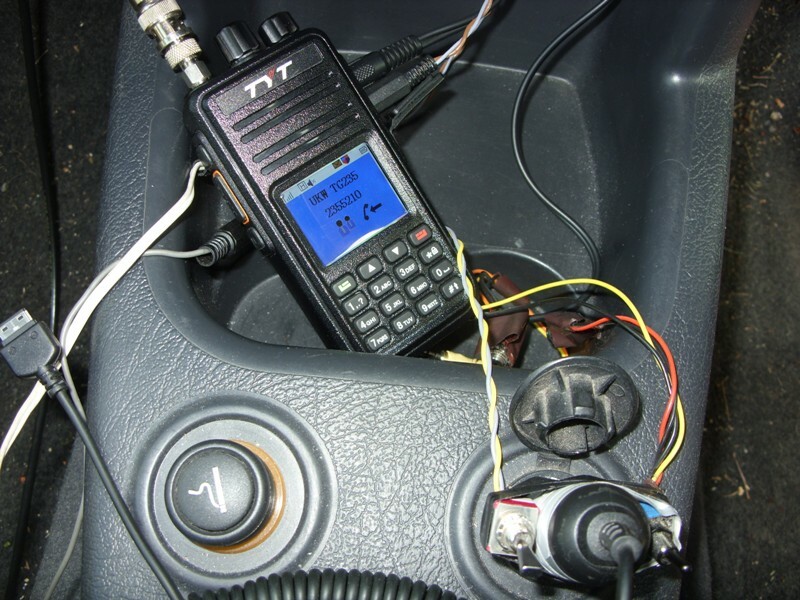 In the old days you could get more RF power out by running your handheld on 10 or 12V derived from the vehicle supply, but the modern radios produce just as much output when running from internal batteries. Also, this approach prevents alternator whine and ignition noise from the car electrical system appearing on the transmitted or received audio. The cigarette lighter plug here is a mobile phone charger and nothing to do with the radio set-up. There are a couple of general comments I would like to make about the TYT MD380, in case you are thinking of getting one. I find the display quite difficult to see out doors in daylight - quite impossible if the sun is shining on it. The colour display is very pretty indoors, when the backlight is on, but goes completely blank when the back-light switches off. I find I am constantly twiddling the volume, or pushing the power up-down button just so the light will come on and I can read the screen. Also the radio is supplied with a charging stand - with a nice LED that is red when charging and goes green when it is cooked. I like that, but it is powered by one of those horrid little plug-top power supplies and it generates S9 noise right across the 50MHz band - ughh! I don't think it has any filtering in it at all, such a shame for an amateur radio product, and makes you wonder about the safety of the device if they can't be bothered to meet EMC requirements. So no chance of using six meters when the radio is charging.